Vancouver, B.C. – April 15, 2019 - Ximen Mining Corp. (TSX.v: XIM) (FRA: 1XMA) (OTCQB:XXMMF) (the “Company” or “Ximen” http://www.commodity-tv.net/c/mid,2697,Company_Presentation/?v=298917) is pleased to announce its Option Partner GGX Gold Corp (GGX: TSX.v), (GGXXF:OTCQB), (FRA:3SR2) has begun the spring 2019 diamond drilling program on the Gold Drop Property, located in Southern British Columbia. - COD18-67: 129 g/t gold, 1,154 g/t silver & 823 g/t tellurium over 7.28 meters core length. 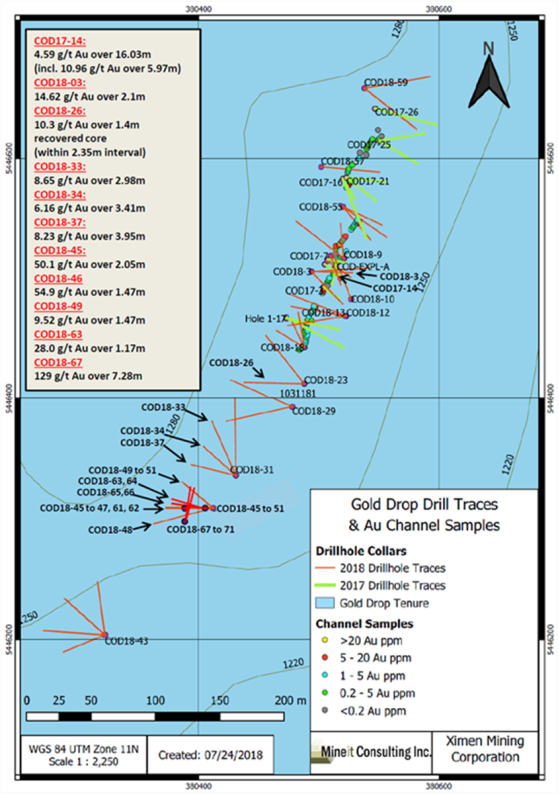 - COD18-70: 107 g/t gold, 880 g/t silver & 640 g/t tellurium over 6.90 meters core length. Mr. Penner brings many years of experience and knowledge to the Company, as a large part of his 30 plus-year career has been spent in the exploration, development, and mining of western Canadian gold deposits, from the coastal mountains of British Columbia to the gold camps of northern Canada and as far as west Africa. His well-rounded skill set includes planning, project organization, surface infrastructure setup, and conventional underground mining. His mining career began developing the high grade, narrow veins of the Bridge River Valley of British Columbia in 1986. Notable projects to-date include the position of mine manager of the QR Mine in the British Columbia interior – a 1,000- tonne per day cyanide operation with multiple underground and open pit mines operating. Other projects include late stage exploration properties such as Selkirk Metals’ Ruddock Creek property, Imperial Metals’ Red Chris property, and Avion Gold’s production gold mine in Mali. His background includes more than eight years of management in development, exploration, and production in both Africa and British Columbia. 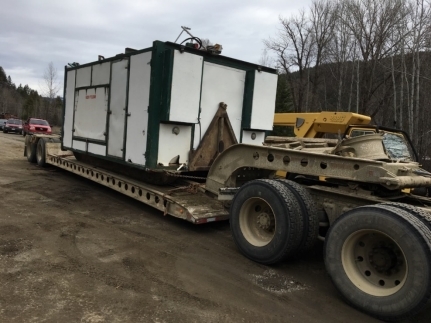 Mr. Penner also has experience working in custom test mining and exploration management of a narrow vein gold project in British Columbia. He is familiar with current mining, government agencies, and environmental regulations in British Columbia, and holds current UG certifications. Mr. Penner’s knowledge and experience with the Kenville Gold Mine (having spent several years assessing it) and with other high grade vein properties like it makes him an integral component in the success of this venture as well should the company complete on the opportunity to acquire the Kenville Gold Mine. This press release contains certain "forward-looking statements" within the meaning of Canadian securities legislation, including statements regarding the completion of a proposed Offering and the use of the Offering proceeds to further explore of the Company’s Cerro Caliche project. Although the Company believes that such statements are reasonable, it can give no assurance that such expectations will prove to be correct. Forward-looking statements are statements that are not historical facts; they are generally, but not always, identified by the words "expects," "plans," "anticipates," "believes," "intends," "estimates," "projects," "aims," "potential," "goal," "objective," "prospective," and similar expressions, or that events or conditions "will," "would," "may," "can," "could" or "should" occur, or are those statements, which, by their nature, refer to future events. The Company cautions that forward-looking statements are based on the beliefs, estimates and opinions of the Company's management on the date the statements are made and they involve a number of risks and uncertainties. Consequently, there can be no assurances that such statements will prove to be accurate and actual results and future events could differ materially from those anticipated in such statements. Except to the extent required by applicable securities laws and the policies of the TSX Venture Exchange, the Company undertakes no obligation to update these forward-looking statements if management's beliefs, estimates or opinions, or other factors, should change. Factors that could cause future results to differ materially from those anticipated in these forward-looking statements include the possibility that the Company is not satisfied with its further due diligence investigations and possibility that the TSX Venture Exchange may not accept the proposed transaction. The reader is urged to refer to the Company's reports, publicly available through the Canadian Securities Administrators' System for Electronic Document Analysis and Retrieval (SEDAR) at www.sedar.com for a more complete discussion of such risk factors and their potential effects. Spamprotection Please add 1 and 9. 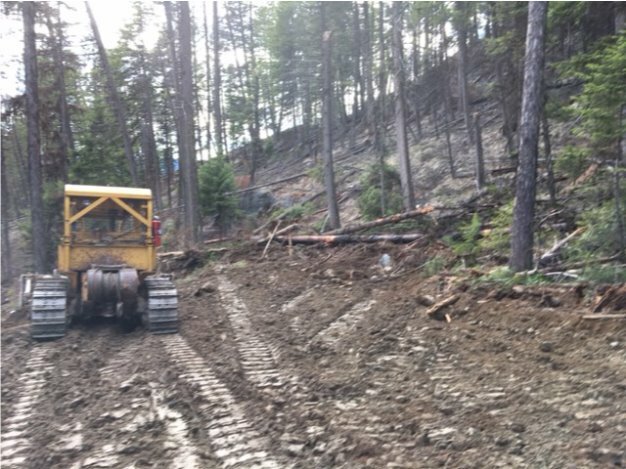 » more news from Ximen Mining Corp.
05.04.2019 Ximen Mining Corp. Acquires Land Package Near Greenwood, B.C.